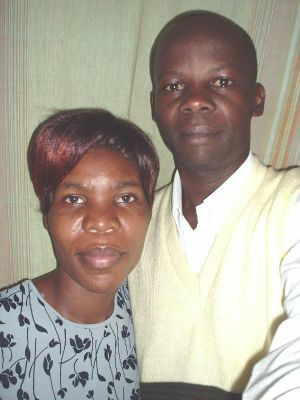 Robert and Esther Mponye wrote to tell us of this new trans-local mission, "Greetings in Jesus' name. It has been a great joy to see people come to Christ, and birthing of a baby local church. On 3rd August, we went to Ssembabule with a team of 27 evangelists from two churches in our community, West of Uganda, nearly 100 miles away from Mityana. This place has been in our prayers and preparation to reach and preach the Good News for some time. God opened the door when we went and the results are worth glorifying God for! Something that happened on the first day of our arrival stunned everyone in the small town of a little over 3,000. As soon as we staged our PA System, we declared that God rains down His glory. It had not been physically raining for over six months and the whole land was brown! That very day, God poured rain in the small town and that was a sign that He was with us in this particular mission. The church has been planted and we are grateful to God for reaching that small town with His love too! Please continue praying for us as we go to other places that have not been reached with the saving gospel of Jesus Christ!" Dear Robert and Esther, be encouraged in your great efforts to reach the unreached in Uganda. Your testimony is glorifies God as reaching the unreached is the greatest commission given to us by our lord Jesus Christ. We are your fellow Ugandans leading a ministry called Conquerors Ministries International - Uganda, located in Mayuge district, South Eastern Uganda. May God bless you. Praise the Lord Robert and Esther! Our prayers are with you as you share the Good News of Jesus to this Community in Uganda. by: Scott & Debra Johnson Geting Free Living Free Min.